Answers to Frequently Asked Questions regarding Synchronet and Microsoft Windows operating systems. Why don't DOS programs run on my Windows Vista, Windows 7 or Windows 8 system? Why don't DOS programs run on my 64-bit Windows system? How do I keep external programs from popping up windows and stealing the keyboard/mouse focus? Why do external programs that use socket I/O not work on my BBS? How do I setup my BBS to support dial-up modems/users? Why is the console output of some DOS programs not sent to the remote terminal? Why do I get !ERROR 11001 calling getaddrinfo() on :: on Windows XP? Why don't DOS programs (e.g. editors, door games) run on my Windows Vista, Windows 7, Windows 8 or Windows 10 32-bit (x86) operating system? You must have SBBSEXEC.DLL rev 38 or later (this is included in SBBS v3.14a). You must copy SBBSEXEC.DLL to your Windows System32 folder. Beginning with Windows 8, Microsoft disables support for 16-bit (DOS) programs by default. 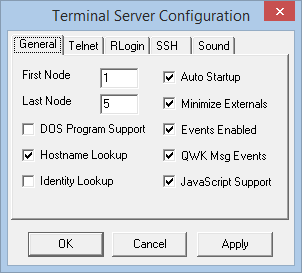 Search for “16-bit Application Support” in the Windows Control Panel and enable that setting. This setting only exists in 32-bit versions of Windows 8 and Windows 10. 64-bit (x64, amd64) editions of Windows cannot run 16-bit DOS programs from Synchronet. See the next FAQ item for the details. Why won't DOS programs run on my 64-bit computer running a 64-bit version of Windows? Microsoft does not include Virtual DOS Machine (NTVDM) support in their 64-bit operating systems. Synchronet for Windows relies on NTVDM for 16-bit DOS program support, so you need to either run a 32-bit Windows version (e.g. re-install, use dual-boot, or run in a Virtual Machine) or forgo DOS programs on your BBS. Yes, you can run 32-bit Windows versions of Synchronet on a 64-bit (x64) system. How do I keep external programs (doors) from popping up windows and stealing the keyboard/mouse focus? Check SBBSCTRL:Telnet→Configure→Minimize Externals or add XTRN_MINIMIZED to the Options key of the [BBS] section of your sbbs.ini file. Why do external programs that use socket I/O (e.g. Synchronet Blackjack, Synchronet BBS List, DoorMUD, SEXYZ) not work on my BBS? Some “security” software (e.g. firewall and anti-virus programs) will interfere with the inheritance of socket descriptors between processes. One such program is the ZoneAlarm Security Suite. Another is NOD32. I don't know if this is an intentional security “feature” or a design flaw. If you have this (or similar) software installed, it may need to be disabled or completely un-installed for socket inheritance to work again. In the “Enter the object names to select” field, type “NT SERVICE\mpssvc”. Then click Check Names. The name should change to MpsSvc. Check Full Control checkbox in the Allow column. Use the SEXPOTS utility in combination with Synchronet for Windows. Why is the console output of some 16-bit DOS programs not intercepted/redirected and sent to the remote user's terminal? Check that your C:\WINDOWS\SYSTEM32\CONFIG.NT file does NOT include Microsoft's ANSI.SYS console driver. Use of this ANSI.SYS driver defeats the interception of console output from some 16-bit console I/O programs. Why do I get the error message !ERROR 11001 calling getaddrinfo() on :: when running Synchronet v3.17 on Windows XP? Synchronet v3.17 defaults to assuming that your operating system supports IPv6. Windows XP does not support IPv6 by default (only IPv4). You can either install IPv6 services on Windows XP (e.g. using the command-line: netsh int ipv6 install) or set the Interface key values in your sbbs.ini file to exclude the IPv6 all-interfaces address: ::.